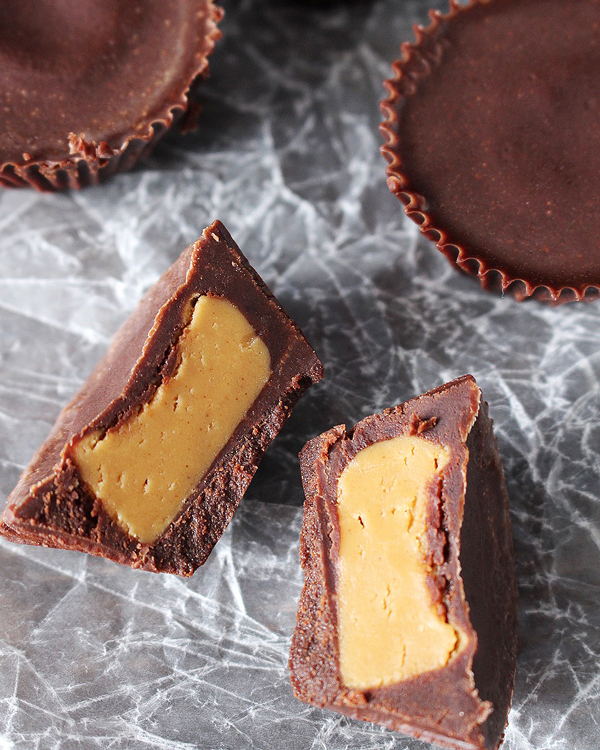 These Homemade Peanut Butter Cups are easy, only have 5 ingredients, and a healthy version of the popular candy. 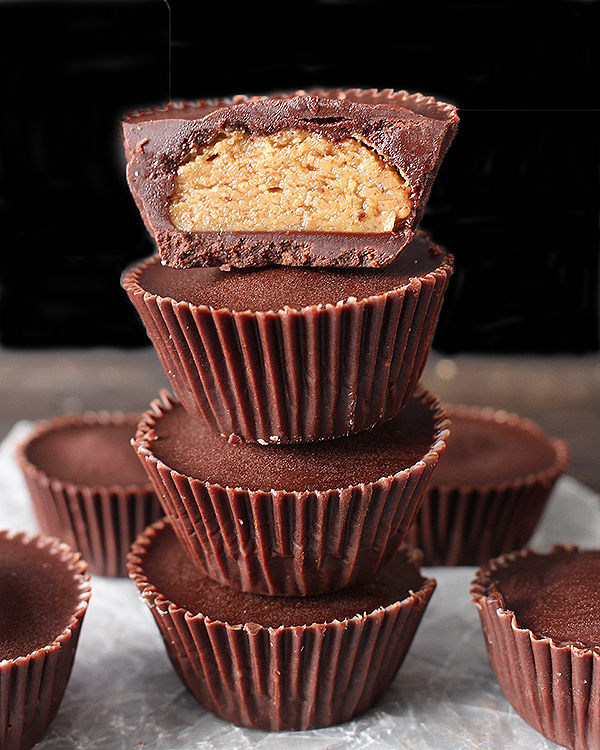 Peanut Butter cups are so popular and making your own is easier than you may think! You most likely have all the ingredients already and it only takes a few minutes. They do have to chill in the fridge in-between steps, but there is nothing difficult or tricky about them. I have made 4 batches in the last couple weeks because they are so delicious and quick to make! 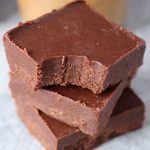 The homemade chocolate is so easy to make and naturally sweetened. The directions say 2-3 tablespoons of maple syrup because that is kind of personal preference. I made a batch for my dad and I used 3 tablespoons because I know he likes things a little sweeter, but the batch I made my husband I only used 2 tablespoons and they came out more like dark chocolate which is what he prefers. If you want them like the store bought kind then use 3 tablespoons. These are best stored in the fridge because of the coconut oil – it has a melting point of about 77° so they will get soft if left out. They can be stored in the freezer as well. 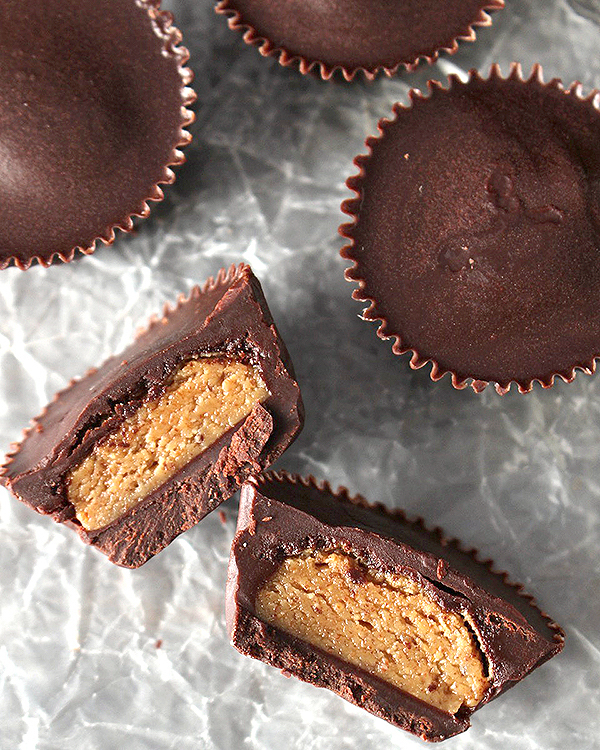 Whether you fill them with almond butter or peanut butter, they are delicious! 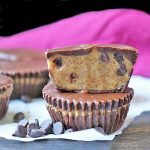 They are the perfect ratio of chocolate to nut butter and they are melt-in-your-mouth good! Line 12 mini muffin tins with liners- parchment works the best. In a large sauce pan, combine coconut oil, cacao powder, maple syrup, and salt. Heat over medium heat and whisk until fully combined. As soon as it starts to boil, turn off the heat. Spoon about 1 tablespoon into each liner. Once they all have some chocolate in them, tilt the pan gently in a circle to get the chocolate to go up the sides a little. Leave the remaining chocolate in the pan for the top. Place in the fridge for 10-15 minutes- until they are fully hard. While they are chilling, make the filling. In a small bowl, combine nut butter and the maple syrup. Stir until well mixed. Remove the chocolate from the fridge and fill each one with a little of the nut butter mixture until all the mixture is used. Spoon the rest of the chocolate over the nut butter, making sure to completely cover it. *If the chocolate mixture has hardened, turn the heat on low until it’s smooth again. 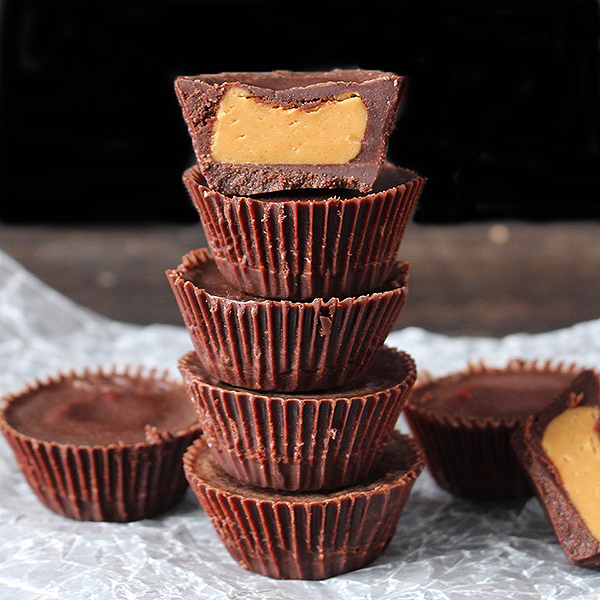 Place cups back in the fridge and let them chill for 20 minutes, or until they are completely hard. To easily remove cups, run a butter knife around the edges then peel off the liner. Store in the fridge or freezer. Would almond oil work in place of coconut oil? 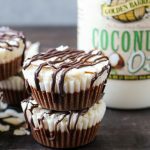 I really want to try this recipe but I cannot use coconut oil. Thanks! Hi Linda! I’m not sure if almond oil would work. Coconut oil works because it hardens in the fridge and I don’t know if that oil would do that or not. I’m sorry I can’t be more of a help! Let me know if you try them and how they turn out. Thanks! You mention maple syrup in both the directions for the chocolate and for the nut filling. Is it 2-3tbsp for each application? Hi Rebekah, That was my fault about the filling ingredients missing. It is now added. Sorry about that. 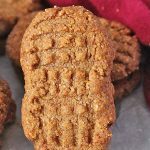 How much of the maple syrup do I use for the nut butter filling? In the recipe above, step 1 says to combine all ingredients. Then in the second step, it says to add the maple syrup again. Thanks for the clarification! Can’t wait to make these! Hi Bonnie- the filling is 1/3 cup peanut or almond butter and 1 tablespoon maple syrup. I’m sorry- that isn’t in the recipe and will be fixed. Sorry for the confusion and I hope that answered your question. Let me know if you have any other questions and I hope you love them! You are awesome!!! I am going to make them right now!! Thanks so much for clarifying. This is a new family favorite! We made them over the weekend for our family and they were a hit! So happy I found you and all your wonderful recipes. Hi Bonnie, the filling ingredients have now been added. Sorry about that. It was my fault. No worries Mitch! Thanks so much! 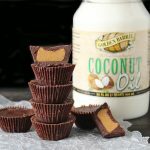 Hi Bonnie, Is the coconut oil measured hard or soft? Hi Madeline, the coconut oil is measured at room temperature, so it’s solid. Hope you enjoy! Can maple syrup be replaced by organic raw honey? Hi Leslie- yes, that will work. Hope you enjoy! The chocolate is WAY too salty! I usually like salty things, but I was sooo disappointed after making these that they were inedible due to the saltiness of the chocolate. Very disappointing. Hi Angie- I’m sorry you found them too salty. I made these with roasted carob powder instead of chocolate, honey instead of maple syrup and left out the salt. I also put them into a silicone mini muffin pan and froze them so when they were ready I could just pop them out of the tray. Plus, I added about 1/4 cup coconut oil to the carob mixture to make it more creamy and blended it with a stick blender in a mixing bowl. 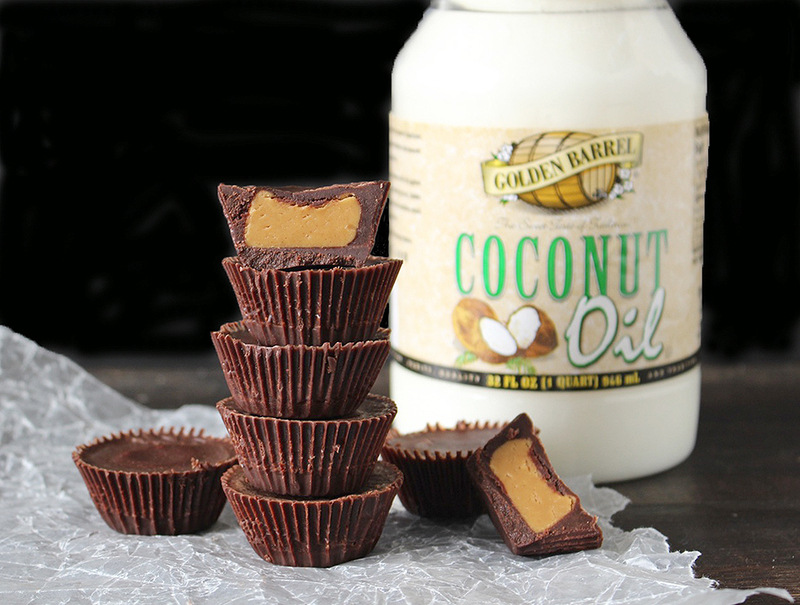 (It’s so hot right now that our coconut oil is completely melted already). Everyone loves these and I posted my version on my blog! These were just what I was looking for! Thank you! Sorry, that was supposed to say I added coconut milk to the carob mixture, not oil. Hi Sarah- I don’t, but you can use a site like My Fitness Pal to calculate that for you. Hope you try them!